Ever wanted a simple, no frills method to backup your Android APK files to your SD card, PC, or even to cloud storage services like Dropbox, Google Drive and Box? Well, then you can do exactly this by using Easy App Toolbox, a new Android app that allows you to backup all of your apps in the most easiest possible way ever. Of course there are those powerful, and feature rich apps like Titanium Backup but it requires you to root your Android device. 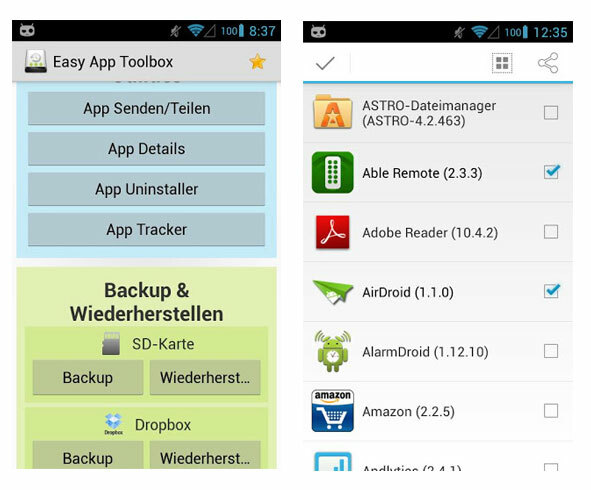 There are many such backup apps, but fortunately, Easy App Toolbox doesn’t needs a rooted device, and on top of that, it is a free app. After installing the app, run it and then select the backup option. From the next screen, you can select where you want to backup, such as SD, Google Drive, Dropbox or to the PC. Next, select the apps that you want to backup. That’s all you need to do. However, there are some limitations imposed by the app. For example, it can backup only 3 apps for the free version, and this limitation can be bypassed by an in-app purchase. Also it backs-up only APKs and the app data, which means your saved games and settings won’t be backed-up. This app is very useful, as it comes with not just backup but also restore option. Simply select the restore option to restore your APKs. This is very useful just in case your favorite apps get pulled away from the Play Store. The app also allows users to share the installed apps (APK files) to your friends. Backup and Restore your apps to/from Dropbox. Backup and Restore your apps to/from Google Drive. Backup and Restore your apps to/from Box.net. Backup and restore your apps to/from SD card. Backup your apps to your PC. View many detailed information about your installed apps (permissions, activities, services, files and folders, etc. Easy uninstaller – gives you batch uninstalls. Note: This app is no longer available on the Play Store. Instead you can use another app named as App Backup & Restore. Get it from here.